Posted on May 2, 2013	by Alice C.
What is your pencil? What is the one tool that feeds your creativity and is so essential that without it you feel naked and unprepared? I just finished reading The Creative Habit by Twyla Tharp, which is a wonderful and inspiring book. At the end of chapter two, Tharp retells a story about the novelist Paul Auster, who, as a child, had a chance to get the autograph of baseball great Willie Mays. Unfortunately, the young Auster did not have a pencil or any kind of writing instrument with him, so he missed his opportunity to get the autograph. Tharp writes that “from that day on, Auster made it a habit never to leave the house without a pencil in his pocket.” He never wanted to be caught unprepared again. Every creative person has his or her “pencil.” It may not be an actual pencil (although maybe it is), but we all have something we need to carry to be prepared to capture ideas. I use lots of tools, but the one tool I could not live without would be a pencil. I can use any pencil. It doesn’t have to be a fancy artist pencil. I’ve even sketched with a mechanical pencil if that was the only thing handy. 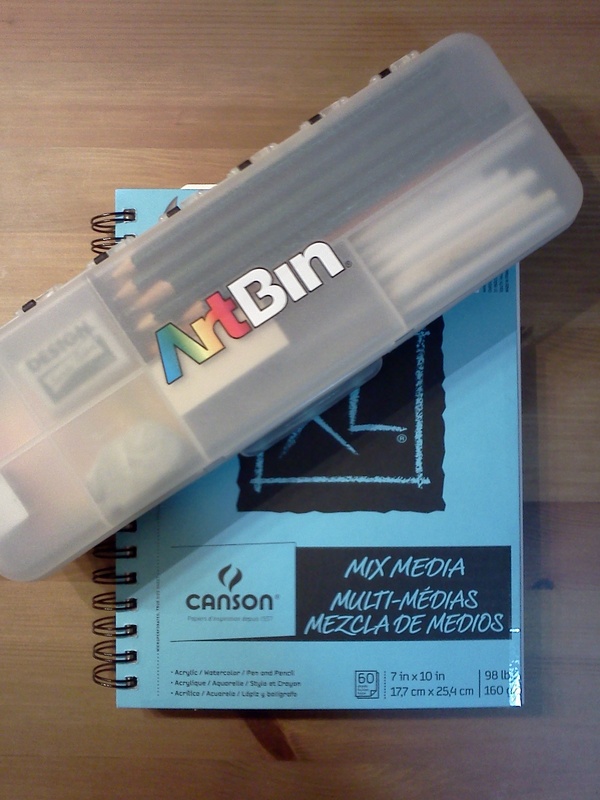 The sketchbook is new, but the pencil case, and the items in the pencil case, are not. I just finally have a portable sketchbook that I can take to work with me, so I am not constantly grabbing post-its and random office paper, trying to capture ideas. Woo hoo! I do feel more prepared now, when I leave the house in the morning, and I know I have my “kit” in my work bag. I’m building the creative habit, one day at a time. So, what is your pencil? This entry was posted in Uncategorized and tagged books, creative life, creativity. Bookmark the permalink.